Ready to propose the idea of a new HCM solution, but not sure where to start? This whitepaper will get you prepared. HR technology has come a very long way. If you’re in the market to buy new people management software, there’s an enormous amount to be considered. You need to identify your business objectives that modern human capital management (HCM) can assist with, do the research, and obtain crucial executive buy-in for your preferred solution. Where do you get started? Janine Truitt, owner and chief innovations officer at Talent Think Innovations, LLC, applies her years of expertise to this question. 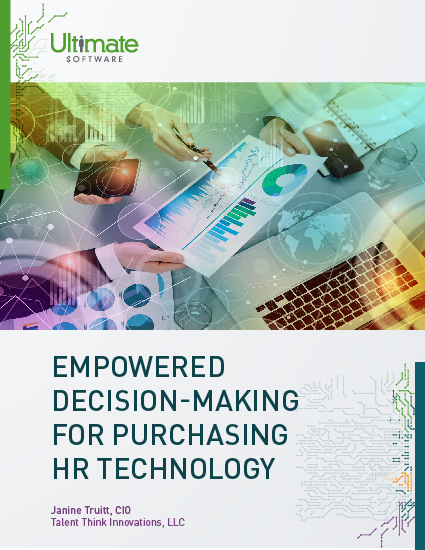 She draws upon substantial industry knowledge and offers a comprehensive guide to identifying a value proposition for your team on building the best possible business case for new technology. Please fill out this brief form to start building your business case.